Note the black swelling on this branch. Photo by Jay W. Pscheidt, 1997. Prunus sp in landscapes and riparian areas can also be infected. Black knot can be extensive on choke cherry trees. Cause Apiosporina morbosa (formerly Dibotryon morbosum), a fungus. The disease is seen occasionally on wild and cultivated native Prunus spp. (plum, chokecherry, etc.) in eastern and southern Oregon and northeastern Washington. It has also been observed on understory trees in the Mt. Pisgah arboretum near Eugene, OR, riparian areas around Corvallis, OR and diagnosed on a home sample in Dallas, OR in 1982. It is rare in landscapes. 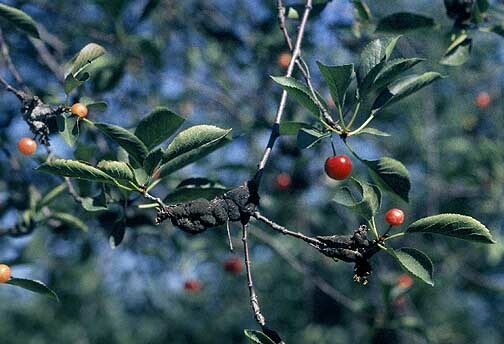 It is an economically important disease of plums, prunes and sour cherry in the Eastern United States. Ascospores infect new shoots from budbreak through shoot elongation. Spores are produced from within 2-year-old knot tissue, primarily during rains at or shortly after bloom. Knots will not appear for several months after initial infection. 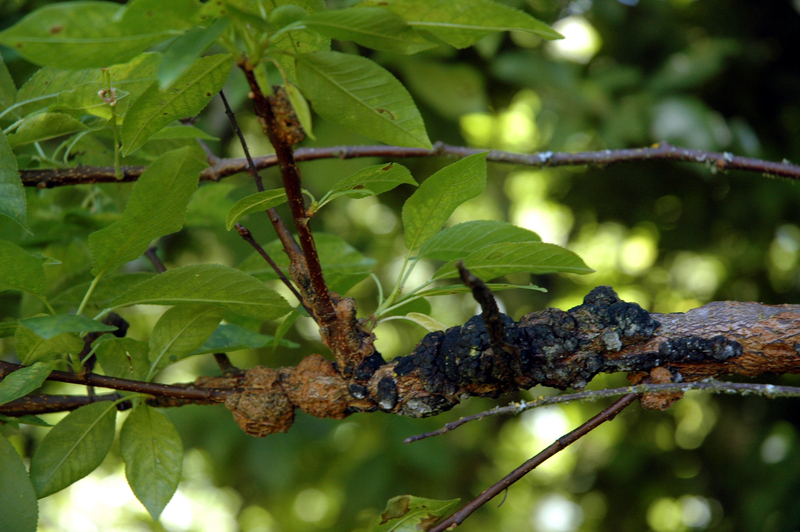 Symptoms Elongate, corky outgrowths or "knots" occur on shoots, spurs and branches of Prunus spp. Knots tend to be longer than they are wide. Newly formed knots have greenish, soft tissue while older knots are black and may be colonized by other fungi or insects. Knots can continue to expand 1 inch or more each year. Limbs are stunted and killed when girdled by the fungal growth. 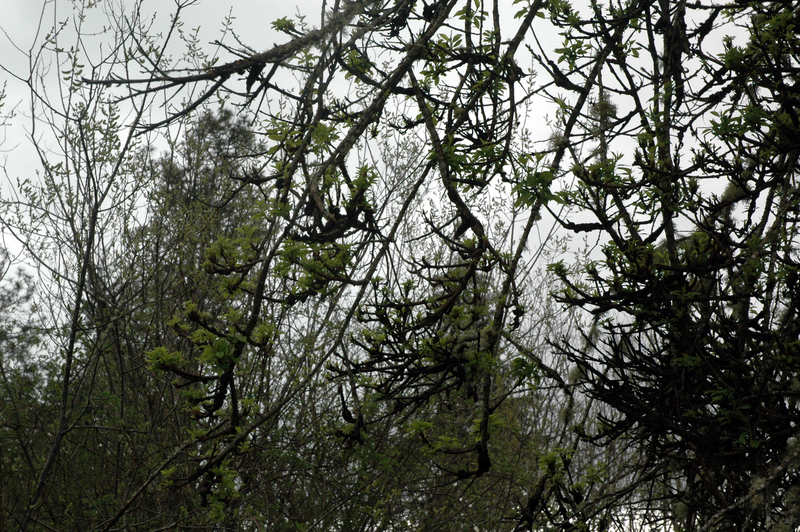 Older knots and growths take on a witches' broom appearance. Known by various names such as "crap on a stick" due to its resemblance to dog poop. Cultural control Remove and destroy knots when observed on economically important crops. Scout adjacent orchards and wooded areas each winter for infected Prunus spp., which can act as a reservoir of spores. Remove branches 2 to 3 inches below knots and burn or bury infected debris. Chemical control Not warranted for crops grown in the Pacific Northwest. Reference McFadden-Smith, W., Northover, J., and Sears, W. 2000. Dynamics of ascospore release by Apiosporina morbosa from sour cherry black knots. Plant Dis. 84:45-48. Pscheidt, J.W., and Ocamb, C.M. (Senior Eds.). 2019 Pacific Northwest Plant Disease Management Handbook. H - Homeowner packaging commonly available. O - Acceptable in organic production.